The evidence for the Higgs particle was already provided in 2012. But that does not mean that everything in the Standard Model has been resolved. In 2014 researchers from Nikhef analysed the detailed series of measurements from the Large Hadron Collider (LHC) for the years 2011 and 2012. Now they are ready for 2015, the year in which the LHC will operate with double energy. In 2012, researchers from the ATLAS and CMS experiments at the CERN particle accelerator (LHC) provided evidence for the existence of the Higgs particle. However, this does not mean that the work is finished. The theory behind the Higgs particle states that the mass of elementary particles is not an intrinsic property of particles but solely the consequence of the interaction of the particles with a Higgs field. The Higgs particle can be considered as the quantum fluctuation of the Higgs field. That makes the particle a particularly interesting subject for research. The Higgs particle allows scientists to directly measure the coupling between the Higgs field and elementary particles, therefore independently of the observed mass of elementary particles. The researchers express this in the probabilities of Higgs particles decaying into various other particles. In the Standard Model these couplings must correspond exactly with the observed masses of the particles. In the proposed expansions of the theory, the Higgs sector in Nature can be more extensive. As a result the measured couplings of the observed Higgs particle may not have to correspond exactly to the predictions of the Standard Model. In 2014, researchers from Nikhef re-analysed the data from 2011 and 2012. This new analysis is more accurate because the scientists were able to use more accurate calibrations of the detector and they re-optimised selection criteria for collisions. The researchers also added measurements for extremely rare processes, such as Higgs production in association with top quarks. These measurements can provide new insights into the coupling between Higgs particles and top quarks, which have an intriguing (dimensionless) strength of exactly one in the standard model. Further improved measurements were made for various other properties of the Higgs particle, such as its mass, spin and parity. In 2014 the researchers were also busy with preparations for the second run of the LHC. This run will start in 2015 with almost doubled collision energy. 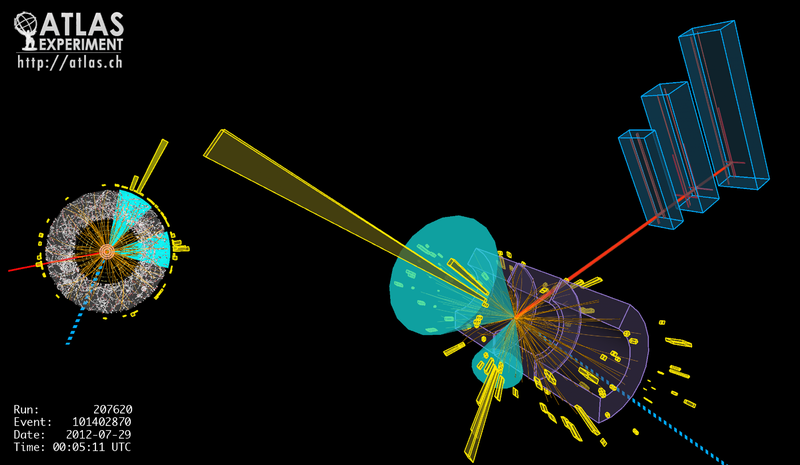 The scientists will see more than ten times as many Higgs particles in the second run than they did in 2011 and 2012. A collision between two protons in the ATLAS experiment. This collision contains traces that are consistent with the production of the Higgs boson in association with a W particle after which the Higgs particle decays into two b-quarks. The green cones are the fragmented remains of the two b-quarks observed. The red track and the blue dotted line are the decay products of the W particle, which are a muon and an escaping neutrino respectively. The direction of the (undetectable) neutrino has been derived in the reconstruction from the imbalance of the total observed energy in the detector.